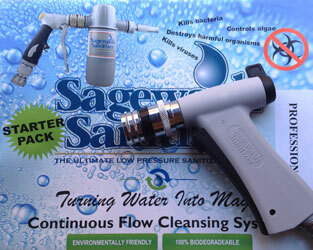 The Sagewash Sanitizer presents a balance between simplicity and sophistication in continuous flow disinfection that has resulted in immediate acceptance by a varied group of users operating in a broad range of industrial, public and private sectors, including: Food Service & Hospitality, Amusement Parks, Food Concessions Supermarkets, Deli & Butchery Areas, Food Delivery and Warehousing Food Processing, Restaurants, Delivery Areas and Kitchens, Agriculture, Farms, Diary, Fishing Ports, Transportation Vehicles & Crates, Wet Leisure, Animal Care Sector including: Horse Stables & Yards, Dog & Cat Rescue Centers, Boarding Kennels & Breeders, Patios & Outside Dining Areas, Decking, Refuse and Waste Rubbish Storage Areas, Wheely Bins etc etc! Tested & proved 99.99 % Effective against..
Sagewash is a hand held spray gun that produces a constant flow of Sanitizing & Disinfecting Solution . It has a screw on, centrally mounted cylindrical container that holds a solid capsule of Calcium Hypochlorite. When a water supply from a standard 15mm hosepipe is attached, the water fills the container, wets the capsule and the dilution is fed to the patented Hydro Venturi which produces an accurate mixture. Sagewash Sanitizer Hydro Venturi system automatically measures and controls the mixing for a consistent level time after time.